Villa privée Espagna Oasis @ Ft Laud..Beach: Maison privée (GRANDE PISCINE) !! 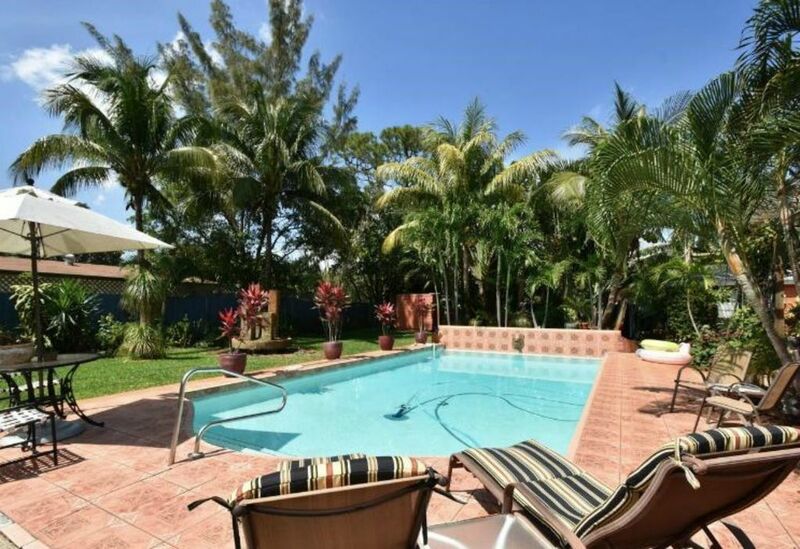 Villa privée Espagna Oasis @ Ft Laud..Beach: Maison privée (POOL & Tennis) !! La propriété est une maison de 2 unités (cette liste correspond à l'unité de 1 chambre), avec des espaces de vie complètement privés et séparés pour chaque unité. La zone de la piscine est la seule zone qui est partagée, et même la zone arrière a une clôture entre les 2 unités pour assurer la confidentialité. Il est strictement appliqué que la confidentialité et le respect de l'unité adjacente sont conservés et toute violation de cet accord ne sera pas tolérée. Les invités ont un accès complet à la maison et à toute la cour arrière. La piscine est complètement privée à la maison. C'est une maison, pas un condo ou une communauté, de sorte que la piscine et l'arrière-cour sont complètement privés pour les invités. Il y a une allée qui peut être utilisée pour garer une voiture pour les invités. Nous sommes toujours là pour vous aider. Je, le propriétaire, je vis dans les environs, et je suis toujours disponible pour que les invités aient tout ce dont ils ont besoin pour rendre leur séjour parfait! Le quartier est un quartier résidentiel / urbain branché à quelques pâtés de maisons au sud du quartier populaire de Wilton Manors. Là, vous avez "The Drive" avec de nombreux restaurants bars et la vie nocturne. Ou vous pouvez aller 10 blocs au sud et avoir une autre zone remplie de restaurants, bars et le fameux Las Olas Blvd qui accueille des expositions d'art et Jazz Brunches le week-end. Il y a beaucoup de charme, de caractère et de développement. La maison est située au centre de tout. Il est proche de la plage, du centre-ville de Fort Lauderdale, de l'aéroport, du terminal de croisière de Port Everglades et de l'autoroute I-95 de l'Interstate. Vous pouvez accéder à tous les points de la ville en quelques minutes. Cependant, la plupart des invités adorent la piscine et la maison, souvent, ils restent sur la propriété et apprécient les hébergements pour la majorité de leur voyage. Donc, que vous cherchiez des vacances relaxantes ou que vous cherchiez à explorer les attractions environnantes du sud de la Floride, c'est l'endroit idéal pour vous! Une voiture est recommandée, mais vous pouvez utiliser complètement les transports publics en recherchant le Transit du comté de Broward. Il y a des arrêts à 2 pâtés de maisons de la maison. Cependant, la plupart des clients qui n'ont pas leur propre voiture gèrent très confortablement avec UBER, car tout se trouve à une courte distance en voiture. C'est très touristique et vous pouvez vous rendre facilement et facilement de l'aéroport. La même chose avec la plage et le train Tri-Rail (à proximité) qui vous donne accès aux systèmes de transport public Miami et Palm Beach. Certains clients apprécient la location de scooters ou de vélos pour la semaine. Étant donné que la majorité des choses touristiques sont si proches, un scooter est un moyen rapide de se déplacer. Le délai d'arrivée est flexible (sur préavis) et dépend de la présence d'un visiteur avant votre arrivée. La vérification par défaut est à 5 heures et le check-out est 10 heures. Nous offrons des check-in tôt et des check-out tardifs pour accueillir nos clients. Si vous achetez un chèque anticipé ou un départ tardif, il est garanti. Les prix indiqués sont basés sur les heures de check-in par défaut. Douche a en fait deux têtes de douche séparées et une douche de style méditerranéen carrelé. The neighborhood was questionable. Boarded up house across the street with a police car in the driveway. Obviously the neighborhood is not his fault. Inside of the house was in disrepair. Smoke detector dangling. 2 dinner forks, 2 wine glasses, dirty pots and pans in the oven when we arrived. Musty odor. Pool needed attention and we had to ask for it to be cleaned. We were there for 2 weeks and provided 2 towels. Had to ask for more. Lucas was responsive to our requests but we hated to keep asking. Positives: Nice new appliances. Loved having a gas stove. Shower was very nice too. We also enjoyed the pool. With a little work this place could be nice. I will start by stating that some guests I've encountered during my 3 years of renting out vacation rentals, simply will never be pleased no matter how much you try to accommodate them. These sort of guests would find something to have issues with even at a 5 star Ritz Carlton resort, and sorry to say, Elizabeth was one of these guests. Even she would text at 11 PM complaining that there was no broom, to which I responded promptly advising that there should be a vacuum there. She then replied and stated that she found the vacuum, and even her husband expressed his apologies for the constant attention Elizabeth required. On that note, the one issue that is valid are the couple of dirty pots and pans that were hidden inside the oven, that my cleaning crew regretfully overlooked, so for this I will take ownership. During Elizabeth's stay, there was some rough weather, which caused some leaves and debris to fall into the pool. My pool cleaners come on Wednesday every week, but to appease the guest, I requested that the pool cleaners come a couple of days earlier to clean out the leaves (there is also a net there for guests to use). Regarding the neighborhood, this is one of the fastest growing neighborhoods in Fort Lauderdale with brand new townhomes and shops being built around the entire neighborhood. The "boarded up" home across the street is one of these homes that was bought recently and will be the new site of one of these townhomes. Whereas the police car actually belongs to one of the new neighbors that has recently purchased one of the new townhomes, and lives in the neighborhood. 2 doors down from the house is another new neighbor that is another law enforcement gentleman, along with other neighbors that include a lawyer and some other diverse tenants that reside in this quiet neighborhood. Most of my previous guests actually like the added security of having law enforcement living in the neighborhood, but Elizabeth rather felt it better to speculate and be paranoid, even though she had spent very little time in the area. Mind you, in my 3 years of owning the property, I have had ZERO issues regarding safety or security, and this is in a neighborhood located less than a mile away from downtown. Lastly, regarding the smoke alarm, I advised the guest that this was being replaced since the alarm would beep without reason, so I simply unhooked the device to stop it from beeping until my electrician could address the required repairs. Beautiful pool, but dated condo in an unwalkable neighborhood. The backyard of this home is really lovely! Beautiful foliage and trees, a pretty pool, chairs to lay on, just what I’d hoped for. However, I ended up cutting my stay short by a week and a half because the location wasn’t very good in my opinion. As for the condo, it’s dated and the bathroom is small, but that wasn’t a huge issue because I didn’t head to Florida to stay inside. The shower was a problem because it’s very small and the shower head was broken. Water pressure and temperature were great, however the head either had to be held in your hand or I had to crouch down to get under the water. It’s European style so you can either hold the shower head in your hand or, in theory, place it in a holder and adjust the holder to the right height. The holder was broken so it did hold the shower head, but it didn’t stay at the necessary height which meant I had to duck down. The real issue for me was neighborhood. In theory it didn’t look bad, a 10 minute Uber to the ocean, but the area wasn’t walkable at all. This neighborhood looks to be changing, with building happening nearby, however I didn’t feel 100% safe. I’m from Chicago and live in the city so I’m not a sheltered person by any means, however I didn't feel safe walking to the grocery store or going for a run in the neighborhood. I forfeited a majority of my stay to move to a hotel in a better location because of it. That said, if you’re looking to hang at a beautiful pool and enjoy a perfect backyard, this place definitely has it! Ideal for people with a car who want to zip to the beach or Las Olas, not for people who want to walk to activities, bars or restaurants. Attractive exterior, worn out interior. This rental has potential but needs maintenance to equal other vrbo rentals in this price range. Many lights and blinds were broken, rear slider needs repair. We've rented on vrbo for 15 years. Great property as advertised. Very accomodating at short notice. Great back yard, fully enclosed and perfect for small dogs. House is well equiped and as described in listing. Would definitely stay again if in the area. Nice clean apt for few people. Homey feeling. Salt water pool relaxing and very clean. Easy to find and get around Ft Lauderdale from there. Lucas easy to contact and available if problems occur- fortunately we didn't have any problems. The New Cuban restaurant is nearby with very good food and uses Grubhub to deliver- nice. Had a great stay. Relaxed by the pool and nice cozy villa. Lucas was great at responding to my questions and even stopped by while in the area to greet me. Plan to stay again!